I’m just minding my own business being a chocolatey marshmallow cereal dream. I mean here I am looking like everything your breakfast should look like. Hello my beautiful bloggers! It’s about time for another recipe. How are all my fabulous readers doing? Did you have a lovely weekend? I sure hope so. If you didn’t, I hope this week amends for the weekend’s transgressions. 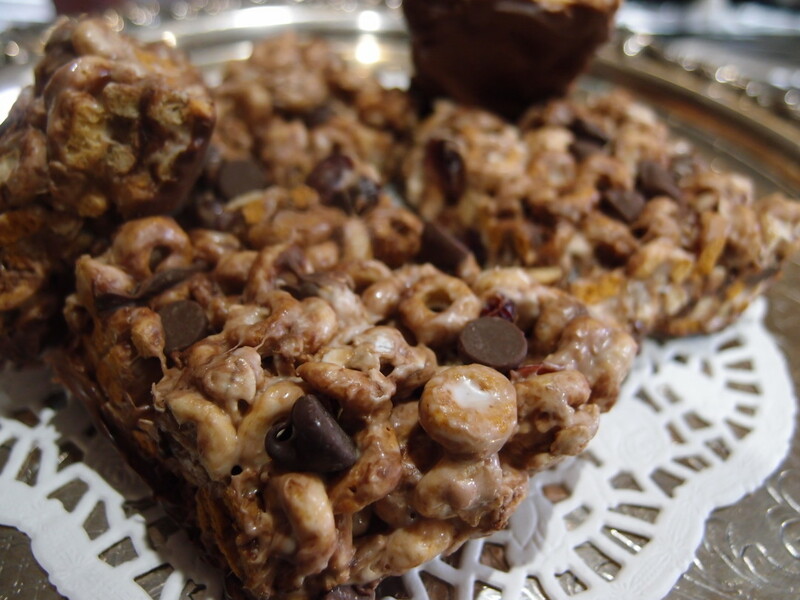 This recipe was inspired by cereal and my love for it. Anyone else on here love cereal? If you do, this recipe will without a doubt make your life because it is delicious! This is my chocolatey rump. You may gaze upon it. You don’t need the oven for this recipe but I like to let it know it’s an absolutely indispensable tool in my kitchen. You can do this by either giving its window a nice supportive rub or by singing it a little song full of praise. A little ditty kind of like this “Oooooh my oven! My beautiful ooooven! You make my kitchen so nice and warm! You work so hard please don’t act scooorned”. In a large microwave proof bowl you’ll want to melt your marshmallows and butter. Begin by telling the marshmallow how much you respect its bounciness then quickly add, because we want to avoid making the butter jealous, how much you appreciate the butter’s rich texture and beautiful yellow color. Once these ingredients are in a good mood, you can heat them up. It takes about a minute and a half if not more or less time for the ingredients to melt. It depends on the strength of your microwave. As soon as they start melting, you want to mist them together. I suggest starting with 30 seconds and adding more time depending on how things look. I added a small handful of milk chocolate chips to the warm marshmallow mixture and mixed them in. I wanted to give the marshmallow a chocolatey flavor because chocolate makes everything better, I promise. You don’t want to add too much chocolate to the marshmallow mixture maybe just one tablespoon. As soon as that’s done mixing, I added all of the other ingredients and started folding them in. Once everything is added and no longer too warm too work with, I plopped the beautiful marshmallow cereal bar lump into a glass dish covered in wax paper because LOOK MA NO MESSES! and squished it in while spreading it. I’d like to also add that I do not live with my mother, nor do I mind getting dirty. I just hate doing the dishes! I am a fortress of delicious marshmallow cereal bars. 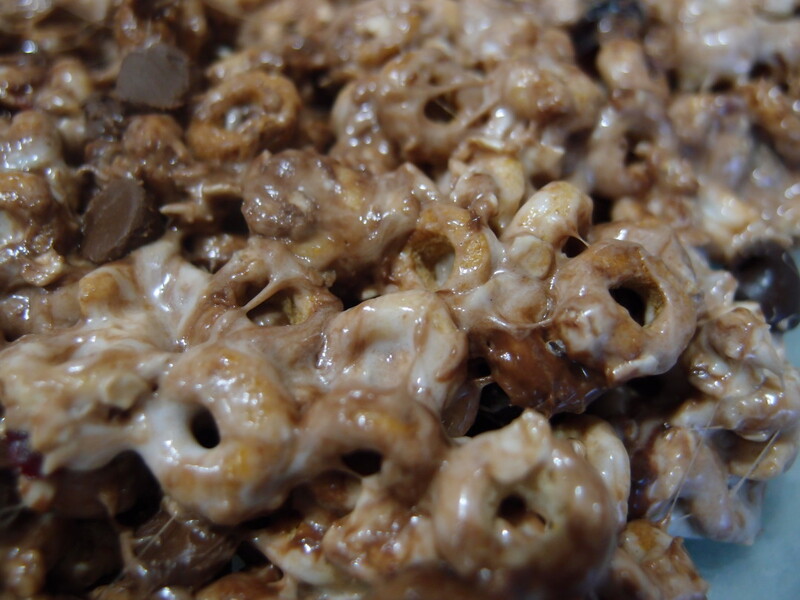 Does the mixture finally look like a fortified chocolatey marshmallow wall of cereal bars? Good. Give your self a round of a applause! You’re nearly done! Now, all you have to do is melt the chocolate to dip them in. This part is optional specially if you don’t like chocolate that much. 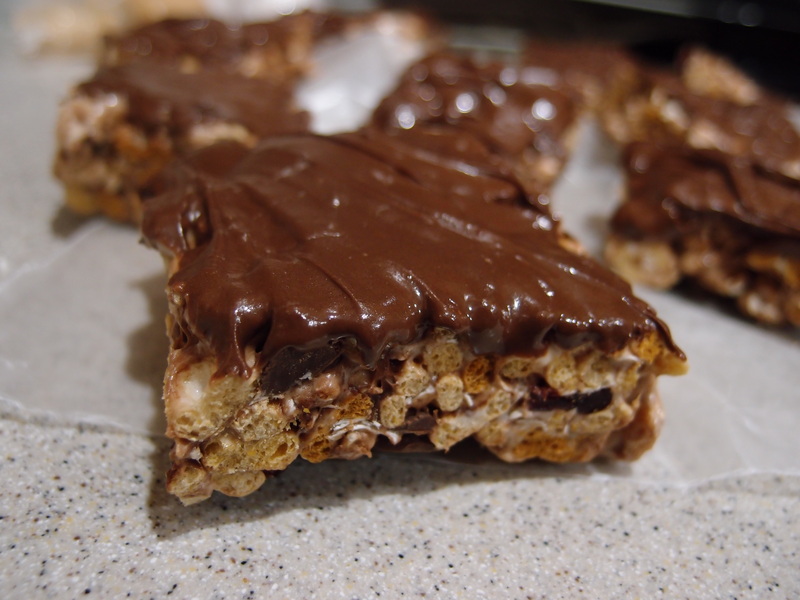 This just gives the chocolate marshmallow cereal bars an extra kick. 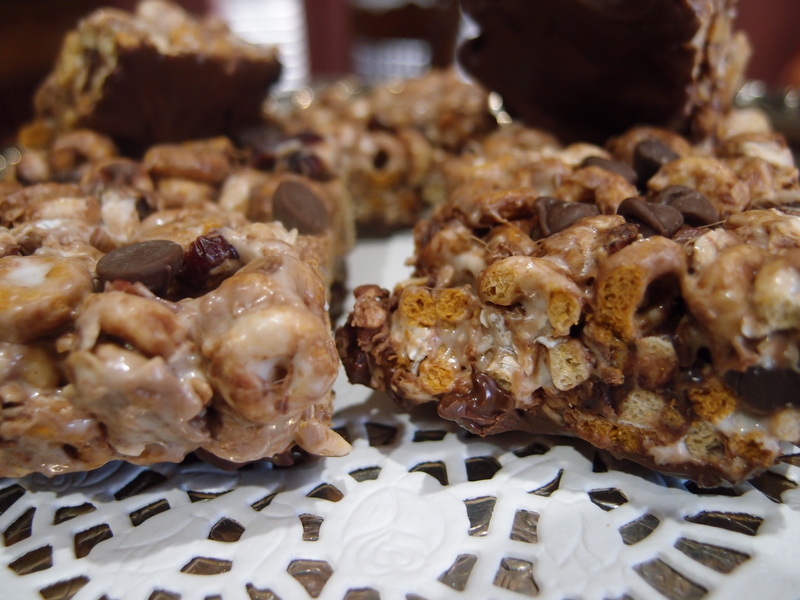 Melt the chocolate in a double boiler or in the microwave and then dip your bars. Let them rest in the fridge for about half and hour and then serve them to whoever is around you, not your dog, though. Chocolate kills dogs. Hello? Can you see me? Look at my chocolate bottom and think about these cereal treats. oh yes! hubba hubba, loving this treat.